Ho Ho Ho Holiday Costume Contest 2015! ‘Tis the season for Holiday Costume Contest! 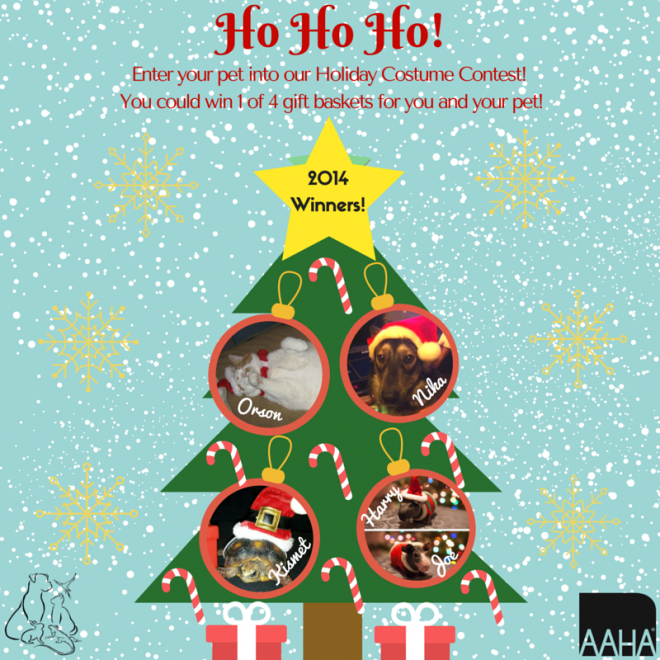 Dress your pet up in a holiday themed outfit and you could win 1 of 4 gift baskets for you and your pet. The more creative the better! We hope 2014’s winners provide some inspiration for you. Our staff will vote on best dog, best cat, and best rabbit/small animal, and we will also run a Facebook contest and have a prize for Fan Favourite. 1) E-mail your entry to [email protected] with the subject “Holiday Contest”. 2) Message our Facebook page with your entry and e-mail address. 3) Visit our Facebook page, comment on our pinned post with your entry, and message our page with your e-mail address. 1) HAVE FUN! We are so excited to see your pet’s adorable and creative (but safe and comfy!) costumes. 2) Submissions close at 11:59pm PST on Sunday January 3, 2016. Fan Favourite voting begins on Monday January 4, 2016 and ends on Friday January 8, 2016. All winners will be contacted via e-mail and announced on our Facebook page on Saturday January 9, 2016! 3) This contest is open to all pet owners capable of coming to our veterinary hospital location to redeem their prize. You can be a new or existing client! Only ONE photo entry per species per household (ie. if you have a dog and a cat, you may submit one photo of each pet). Prizes are non-transferable and not redeemable for cash or unrelated services. Prizes must be picked up at our location by February 9, 2016. 4) Our contest is not affiliated with Facebook. This promotion is in no way sponsored, endorsed, administered by, or associated with Facebook. Each entrant or participant releases Facebook from any liability related to this contest. By entering, you are giving Eagle Ridge Animal & Bird Hospital permission to share your submitted photo on our Facebook page and in both print and digital marketing materials.